We are waiting. Waiting to be put on the surgery list for anytime this afternoon, we aren’t picky about what time; just please operate today. We are hoping to be able to get a broviac inserted today. I’m kind of grossed out by the thought of the broviac, mainly because it is an IV that constantly hangs our of his body, but also since he wont be able to have a proper bath for like four months, since we have failed to pit a picc line in Gages arm, a broviac is the only option left to us since putting a port back in is out of the question right now. The San Diego Zoo brought in animals last week, and Gagers loved them! 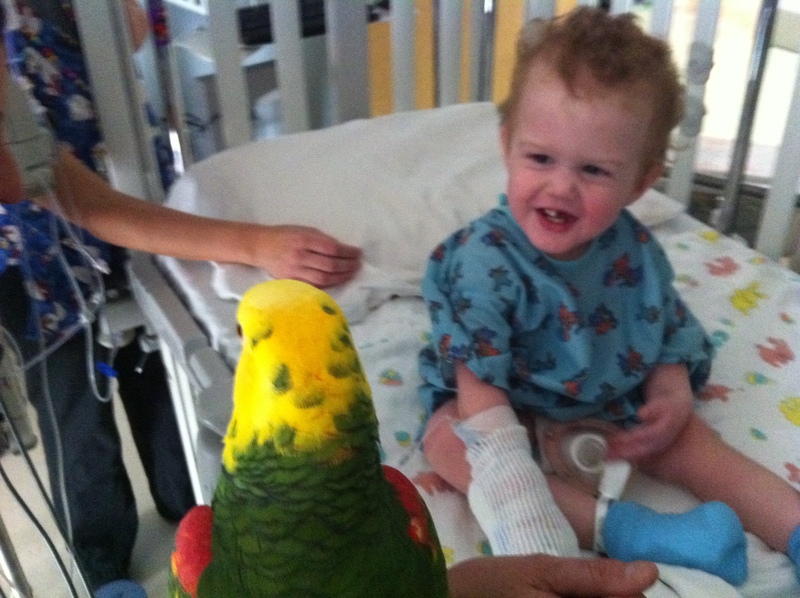 His favorite was this parrot, he liked his bright colors and that the bird could say words! We love the Zoo and that they bring in different animal every couple of weeks, for the kids in the peds unit. It brightens up their otherwise boring days. We still aren’t sure when we are going home, we just hope it’s before Christmas. I think subconsciously I knew we’d be in the hospital the whole month of December. How else can you explain the fact I had ALL of my Christmas shopping done by the last day in November? I just have to wrap everything, which totally isn’t a lot, especially considering the Hubs and I have decided not to do Christmas gifts for each other. oh i love his little hill billy mouth!! he is too cute! I love the birds that can talk too! There was one in Florida that would tell everyone to get back to work. Glad to see a smile on Gage. dang it! you said he’d be out by friday!! He is too cute! Hope you get to leave soon!